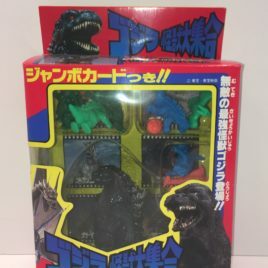 Here is a cool Vintage Godzilla play set made in 1991 by Yutaka Company Japan. This colorful set is great for hours of monster battle fun. The set contains a 4 inch Godzilla and eight smaller Godzilla friends and foes. It was for sale in Japan only in conjunction with the Toho movie Godzilla vs King Ghidora. Made of Vinyl, this vintage play set is in its original packaging. GRAND GHIDORAH! This is one of the most impressive soft vinyl King Ghidorah figures ever made! It is now also VERY HARD to FIND especially in its original box. 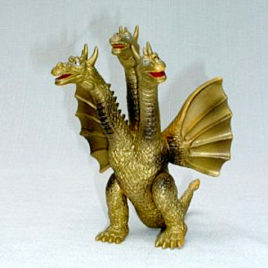 The "GRAND GHIDORAH" stands approximately 12 inches tall and has a wing span of 15 inches! It was produced by the Bandai Co. of Japan in 1998 for the release of the movie "Mothra 3". 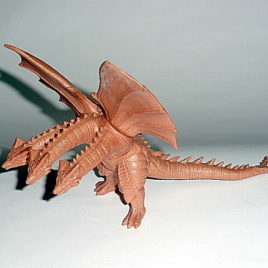 This is the Magnificent Ghidora that Cretaceous Ghidorah transformed into in the movie! The figure requires snapping together which is made easier by heating the vinyl with a hairdryer before insertion. THIS IS A VERY HARD TO FIND FIGURE EVEN IN TOKYO! Comes in MINT condition in colorful original MINT to Near Mint condition box! This is a large very GRAND figure with a Large Box. 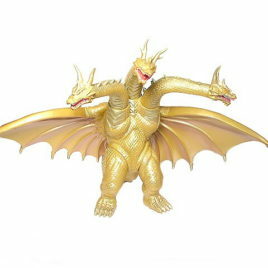 This is the Yamakatsu hard vinyl figure of King Ghidorah that was issued in 1983. 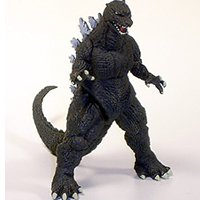 The Yamakatsu Company issued a series of Godzilla figures in 1983 which predate the Bandai line. It stands approx. 7 inches tall. These figures were not issued with tag, THEY ARE HARD TO FIND BECAUSE THEY ARE OVER 27 YEARS OLD! KING GHIDORAH REPAINT!! These are highly detailed vinyl figures for collectors of all ages and great for kids to play with!! They are made of thick flexible vinyl and can stand up to rough play. The figure is the "REISSUE" and has a brighter gold color than the original. 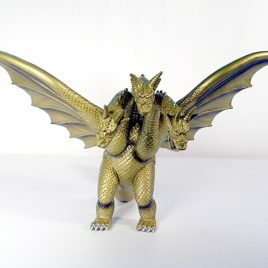 This Fully Articulated King Ghidorah stands approximately 6 inches tall and has an impressive 12 inch wingspan. COMES MINT WITH "PINK STYLE" TAG. Scroll down for additional photos. 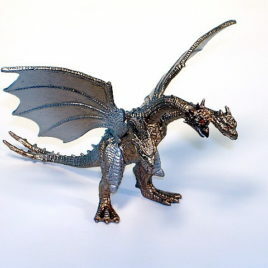 This impressive hard vinyl figure is sometimes called the "Fragile Wing King Ghidorah" because of the thin, brittle vinyl used to form the wings. The vinyl at the wing "tabs" where they fit on the body are especially prone to cracking. This is a very hard figure to find especially without damaged wings. IT IS ALMOST IMPOSSIBLE TO FIND THIS FIGURE MINT IN BOX EVEN IN TOKYO JAPAN!! It stands approx. 14 inches tall! The heads, necks and legs are articulated. Note the photos of the "wing tabs", this is where the figure gets it's nickname "FRAGILE WING KING GHIDORAH" These wings and for that matter the whole figure is MINT, MINT, MINT! IT COMES IN NEAR MINT CONDITION BOX! It even comes with the original instructions. We found this in a little shop on a toy hunt in the back alleys of Tokyo. THIS FIGURE IS PART OF THE "GREAT MONSTER" SERIES FROM BANDAI/POPY RELEASED IN 1984. It sometimes is called the 30th Anniversary King Ghidorah. The wings fit into the slots on the back of the body. Due to the weight of the wings and the thin fragile vinyl of the wings, the tabs have a tendency (no kidding) to crack. Many collectors display this figure with the wings behind the body and not mounted in the slots to prevent cracking. THIS IS A PIECE OF BANDAI/POPY HISTORY AND WILL MAKE A STUNNING CENTERPIECE FOR ANY SERIOUS COLLECTOR. CLAWMARK TOYS WARNING; COLLECTING KAIJU VINYL CAN BE ADDICTING! Scroll down to see additional photos. 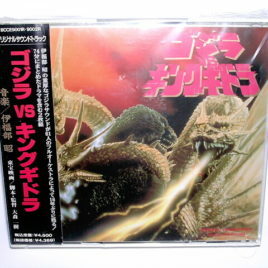 This is the Godzilla VS. King Ghidorah sound track 2 CD Set. Previously owned excellent condition. Does not have the paper insert as shown in photo. BCCE 9001R & 9002R. 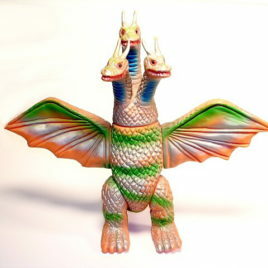 Cretaceous King Ghidora from High Grade Set # 5. The series was produced in 1998 and is NOW OUT of PRODUCTION. Amazing detail and color! These "High Grade" solid vinyl figures stand approximately 2 ½ inches tall. 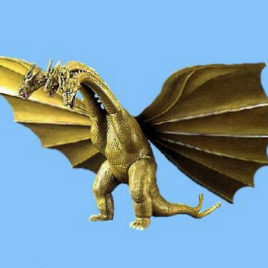 Cretaceous King Ghidorah is from rom the Movie " Mothra 3". With a wingspan of over 4 inches, this is one awesome High Grade Figure!! CLAWMARK TOYS WARNING!! Small parts might be hazardous for very young fans.